What is the graduation System? Why was it needed? We found after 4 years of practicing Buddhism, that we were unable to judge the progress we made in these years. We found our education system very effective in telling our progress and also motivating us for further progress. The graduation System that we devised to judge our progress is similar to our educational system. This will help us to measure our progress and also motivate us. But there is a difference. Here we will have to judge our progress for ourselves as no one else can know what progress we have made. This chapter provides us the necessary progress guidelines. Level 1(1 yr): We are aware of all our actions and are able to avoid breaking any of the precepts in action. Level 2(2 yr): We are aware of our speech in addition to our actions and are able to avoid breaking any of the precepts in action and speech. Level 3(3 yr): We have achieved above level and are aware of all our thoughts and are able to avoid breaking any of the precepts in thoughts. Level 4(4 yr): We are aware of all our thoughts, speech and actions through the day and are able to avoid breaking any of the precepts in action, speech and thought. We maintain awareness all the time. Level 5(5 yr): We have achieved above levels and are able to meditate properly and for at-least 1 hour per day for at least 4 days per week. We now understand the importance, benefits and procedure for meditation. Level 7(7 yr): We have achieved above levels. We understand the cycle of karma better. We understand karma better, i.e. we are aware our such and such an action will bear good or bad or no future implications. Level 8(8 yr): We have achieved the above levels. We understand the different world systems, that of humans, gods, demons, hell, animals and hungry ghosts. We know what kind of action brings one to a particular world system. We understand the impermanent nature of all the world systems. We can empathize with the sufferings of each world system. We are thus motivated to grow above these world systems to be free from sufferings. Level 9(9 yr): We have achieved the above levels. We know all the 12 links of dependent origination. We know which cause has which effect. We are able to intercept on at least one of the links and are able to break the cyclic cause and effect relationship and thus are very near to achieving Nirvana. Thus we know and act such that all your actions, speech and thought are free from cause and effect. All our karmas are now non-volitional i.e. not involving desire or craving. Level 10(10 yr): We have achieved the above levels. We have now attained Nirvana and can see the world as it is. The world as impermanent, with no concept of self and the world full of sufferings caused due to ignorance to see the truth. Thus free from ignorance all actions, speech and thoughts are perfected. We are now an Arahant. But wait! Be cautious! We may not have achieved Nirvana and will be lethargic and can drift back from this stage. So we must maintain our awareness and maintain the state where all our sufferings have ended because of our wholesome acts or acts not involving desire. We may still have to suffer physical pain as our human body has a tendency to decay, old age and death. We may also have to suffer for our bad karma in the past but no new karma is created. The years mentioned against each level is to give an idea of the amount of effort one needs to put at each level to attain Nirvana. Thus with proper efforts we can achieve Nirvana in 10 years or less or more depending on our efforts and grasping of insight and acting upon it and also on the level and effort in meditation. We may not achieve complete perfection in each level unless we go to the next level. E.g. our actions and speech will not be perfect unless we reach level 3 where our thoughts are purified. Our thoughts will not be pure unless we are totally aware all the time of all our thoughts in level 4, which will not be perfected unless in level 5 our meditation is perfected and we have trained our mind to monitor itself. 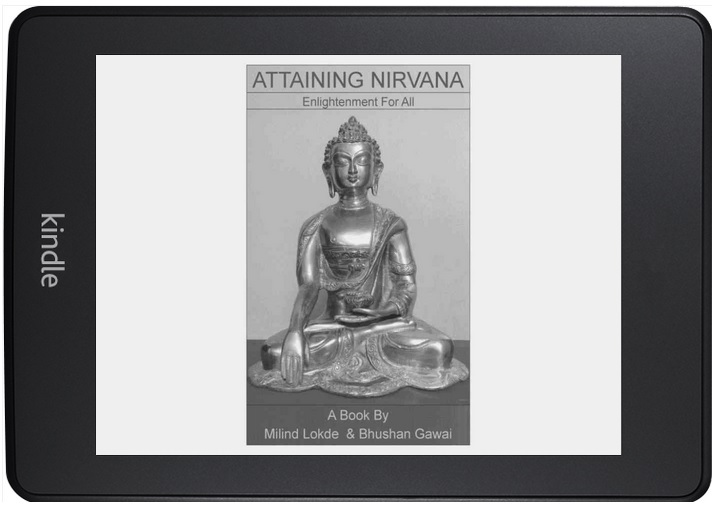 © copyright 2009 Attaining Nirvana book by Milind Lokde and Bhushan Gawai is licensed under a Creative Commons Attribution-NoDerivs 3.0 Unported License. Creator and the Creations – who are we? Will Time Machine remain fiction forever? Attaining Nirvana Create a free website or blog at WordPress.com.